NYC, 02/07/2019, 2:00PM. 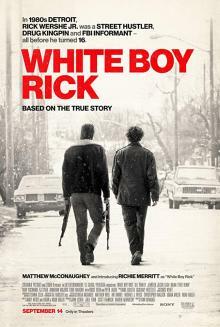 White Boy Rick (2018): Story of a 14 year old FBI informant starring Matthew McConaughey. 111 min. Director: Yann Demange. Starring Matthew McConaughey, Richie Merritt, Bel Powley. The film premiered at the Telluride Film Festival on August 31, 2018 and was released in the United States on September 14, 2018. White Boy Rick has grossed over $25 million.